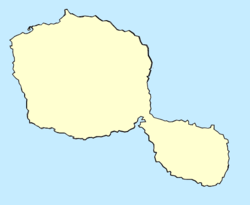 Teahupoʻo (Polynesian pronunciation: [/te.ahupoʔo/]) is a village on the south-east coast of the island of Tahiti, French Polynesia, southern Pacific Ocean. It is known for the surf break and heavy, glassy waves offshore, often reaching 2 to 3 m (6.6 to 9.8 ft), and sometimes up to 7 meters (23 feet). It is the site of the annual Billabong Pro Tahiti surf competition, part of the World Championship Tour (WCT) of the Association of Surfing Professionals World Tour surfing circuit and used to be one stop in the World Tour of the International Bodyboarding Association.Bodyboarding pioneers Mike Stewart and Ben Severson were the first to surf Teahupo'o in 1986 and it soon became an underground spot for thrill-seeking bodyboarders. Few professional surfers rode Teahupo'o during the early 1990s and it was only in 1998, at the Gotcha Tahiti Pro, that Teahupo'o became widely recognized as having some of the heaviest waves in the world. On August 17, 2000 Laird Hamilton is credited with surfing the "heaviest wave" ever ridden, documented in the film Riding Giants. In 2003 the late Malik Joyeux successfully rode one of the largest waves ever ridden. Nathan Florence, younger brother of two-time World Surf League champion John John Florence, caught in May 2015 what some have considered to have been the biggest wave ever successfully paddled in Teahupo'o. Keala Kennelly was the first woman to tow-surf Teahupo'o in May 2005, getting a 10-foot barrel ahead of the Billabong Tahiti Pro contest. This challenging break has been conquered by many top windsurfers, including Jason Polakow and Levi Siver. Yannick Salmon was the first kitesurfer to ride Teahupo'o; however, it was incorrectly written in publications that others had ridden it before him. Jeremie Eloy and Julien Sudrat kitesurfed the wave after Yannick. Teahupo'o is a reef break. The swells mainly break left, but the outer reef also creates right breaks that surfers must be cautious of when paddling out. Teahupo'o is also renowned for the consistent number of barrels it delivers. It is a rewarding location and is widely regarded as being on the 'must-surf' list of every enthusiastic surfer. However, only experienced surfers in peak physical condition should attempt Teahupo'o; heavy waves combined with a shallow shoreline can result in serious injuries and even death in a wipeout. Teahupo'o's reputation for wave riding is partly due to its unique form. An extremely shallow coral reef, which ranges up to 20 inches (51 cm) beneath the water's surface, is responsible for a very hollow-breaking wave. The wave's unique shape, with an effect of almost breaking below sea level, is due to the specific shape of the reef beneath the wave. Its semi circular nature, which drops down sharply creates a 'below water' effect and the extreme angles in descent create an instant instability to the wave. A steep wall of reef causes the entire mass to fold onto a scalloped semi circle breaking arc. The wave bends and races along into a dry reef closeout and the lip of the wave is often as thick as it is tall. Teahupo'o was included on Transworld Surf's list of the 'Top 10 Deadliest Waves' and is commonly referred to as the "heaviest wave in the world". The name 'Teahupo'o' loosely translates to English as “to sever the head” or "place of skulls". There have been five recorded deaths at Teahupo'o since 2000. Most notably was local Tahitian surfer Briece Taerea who was killed at Teahupo'o in 2000, just one week before the annual Teahupo'o WCT event. Taerea attempted to duck-dive a dangerous 12-foot (3.7-meter) wave but was thrown over the falls, landing head first onto the reef. He was recovered from the water, but died later in hospital, suffering from two broken cervical vertebra and severed spinal cord, resulting in paralysis from the neck down. ^ "TEAHUPOO - Legend, True Meaning, True Story | Surf News". Onestopsurf. Archived from the original on 2013-06-25. ^ a b c d e Jason Borte (January 2001). "Teahupoo History". Surfing A-Z web site. Retrieved December 1, 2010. ^ "ASP World Tour". official web site. Association of Surfing Professionals. Archived from the original on November 30, 2010. Retrieved December 1, 2010. ^ Williamson, Morgan (2015). "Heavyweights discuss Nate Florence and the best Teahupoo wave ever paddled". ^ Tracks magazine, August 2005, ISSN 1032-3317. ^ "Tahitian Dreams". Red Bull TV. Retrieved 11 November 2011. ^ "Teahupoo - Anatomy Of A Monster". SurfingAtlas.com. Retrieved 11 November 2011. ^ a b Brower, Ryan (2008). "The Top 10 Deadliest Waves". ^ "Local Knowledge - Billabong Pro Tahiti". Billabong Pro. 2011. Retrieved 11 November 2011. ^ McDonald, Margie (16 August 2010). "Teahupoo hopefuls faced with huge swell". The Australian. Retrieved 11 November 2011. ^ "Surfing Archived Stories". Retrieved 11 November 2011. 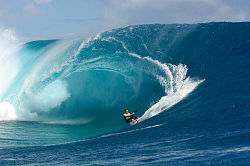 Wikimedia Commons has media related to Teahupoo. Teahupo'o November 2, 2007 photos including photo used above.